Forecasters say this week's weather will bring conditions that will help to control wildfires. 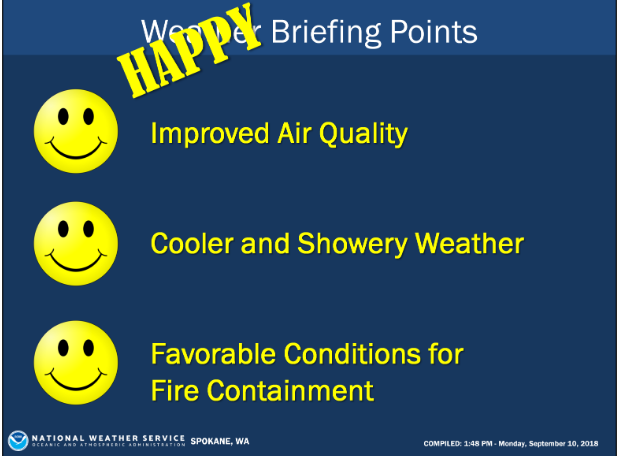 Weather forecasters in Spokane today [Monday] issued what they call a “Happy, Good News Briefing.” National Weather Service forecaster Greg Koch says it has some welcome elements: cooler temperatures, the possibility of rain and better air quality this week. “As far as the precipitation goes, our changes for measurable rain will be the best over the mountainous locations of the state. Most importantly, I think we’re going to have several shots of rain over the North Cascades, where our most active wildfires are burning right now," Koch said. He says there’s a good chance those rains will help to dampen fires and continue to slow their progress. Because of that rain, air quality is expected to be in the good range this week. Temperatures are expected to be several degrees below normal, in the 60s and lower 70s. Spokane will have at least a small chance of rain throughout the week. The Palouse and Columbia Basin are expected to remain dry.